Over the years there have been many different types of products developed to solve the age old problem of snoring. This usually not only affects the person snoring due to disrupted sleep but also affects any other person in the same bed. Anti snoring pillows have been created to ease the issue of snoring allowing you to get back your sleep and comfort you deserve. We’ve created this guide to show you the best anti snoring pillows on the market, to make your buying decision easier. 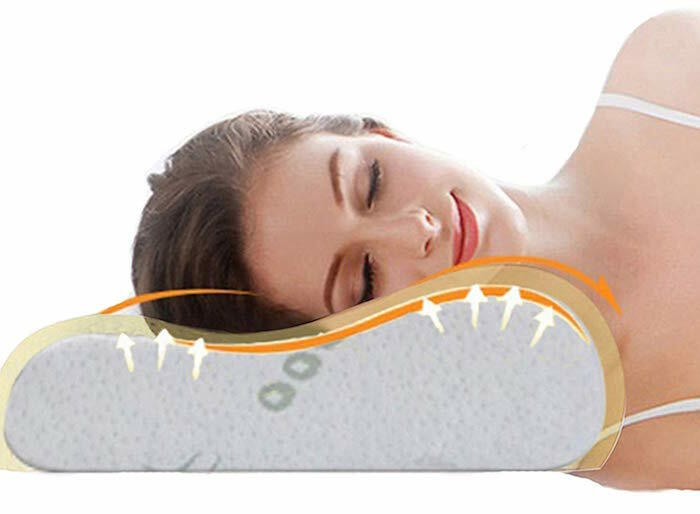 This uniquely designed butterfly wing anti snoring pillow is constructed to not only improve the quality of your sleep but also reduce your snoring. The pillow has a concave depression in the centre which supports your neck and then has higher edges which makes it suitable for back, side and front sleepers. The main material is memory foam which provides support and firmness while also restoring to its original size after pressure is released. This helps to reduce snoring and pressure on the neck. The pillow has numerous health benefits as it improves brain circulation, helps keep breathing airways clear, reduces fatigue, reduces muscle stiffness and effectively supports the head, neck, shoulder and upper back. 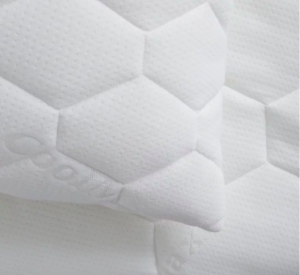 The pillow is encased in a removable fibre cover which can be easily machine washed but is also hypoallergenic and, so it’s ideal for allergy sufferers. This product is top quality, and it’s no surprise that iCloudy is one of the worlds leading pillow retailers. Reduces Snoring, Fatigue and Muscle Stiffness. 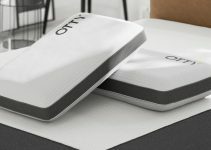 The unique memory foam pillow gives you a firm feeling which makes it suitable for side, stomach and back sleepers. It's because the pillow places your head and neck into a natural position keeping it correctly aligned throughout the night. This natural position also helps to keep your airways clear leading to the relief of snoring and other sleeping disorders that you may suffer from. The pillow is supplied with a 100% money back guarantee so if you’re not happy with the results, then you can return it within 30 days at no additional cost. This pillow isn’t solely for reliving snoring but because it aims to maintain a healthy sleeping position it can reduce snoring over time. Significant improvements can be made to your snoring by ensuring that your head placement is correct, which is what this pillow aims to do. 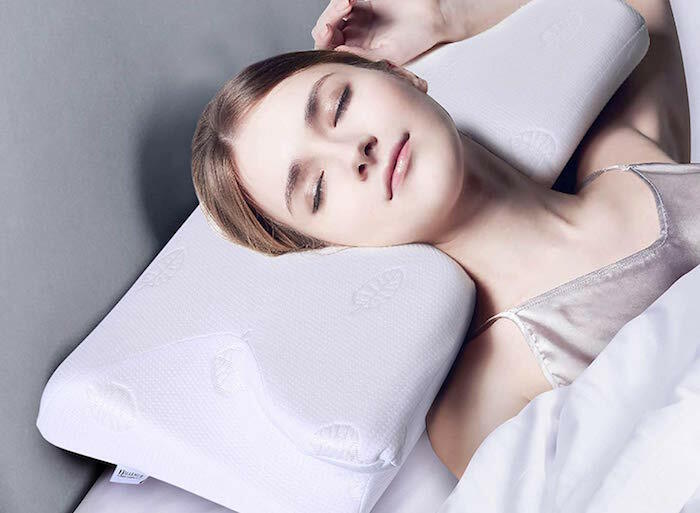 This is a specially designed pillow shape that is suitable for back, side and front sleepers and ensures that you maintain a natural curve in the neck. The centre of the pillow has a unique cavity that helps to cradle the head for increased support while the wedge extension gives additional support to the thoracic spine. The pillow is made from memory foam which is slow rebound which means that support is maintained for the full night. It also provides smoother and clearer breathing leading to a more comfortable sleep which can reduce the level of snoring. The pillow also has a removable zipped cover case which is machine washable and extends the life of the pillow. 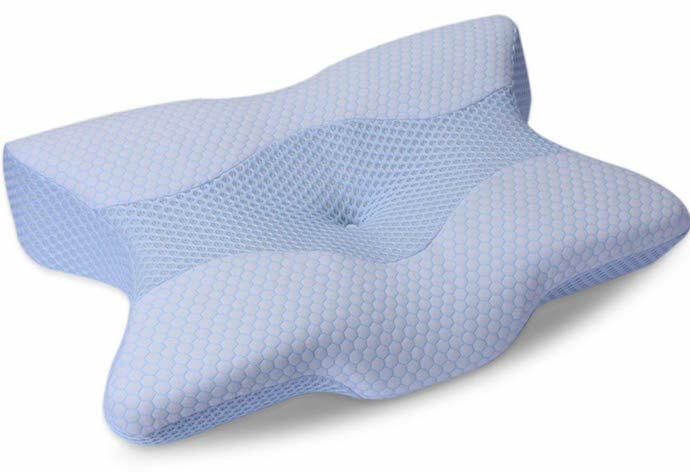 This supportive bed wedge pillow keeps you elevated throughout the night ensuring that your spine remains aligned relieving pressure from your painful areas making sure your airways are open which reduces snoring. The foam bottom holds you up making it suitable for back, side and front sleepers. The pillow is made from high-density memory foam to hug the contours of your body so you can settle down to sleep quickly. Memory foam pillows are known for retaining heat; however, this wedge pillow has been designed with cooling channels in between the memory foam which allows air to circulate to regulate your temperature and wick the body heat away from you throughout the night. The cover is soft and hypoallergenic while also being easy to remove meaning you can quickly remove it and throw it into the washing machine. Also included is a 100% happiness guarantee which allows you to try it out risk-free for 30 days, and if you don’t like it you can return it for a no questions asked refund. This anti snore pillow is designed to support the head and neck area to reduce snoring as you sleep. The pillow is made from conjugate fibre filling and has a soft 50/50 poly cotton cover which is both hypoallergenic and machine washable. This pillow is great if you suffer from snoring or you share a bed with a frequent snorer. The pillow will leave you feeling more refreshed and energetic in the morning ready to attack the day. 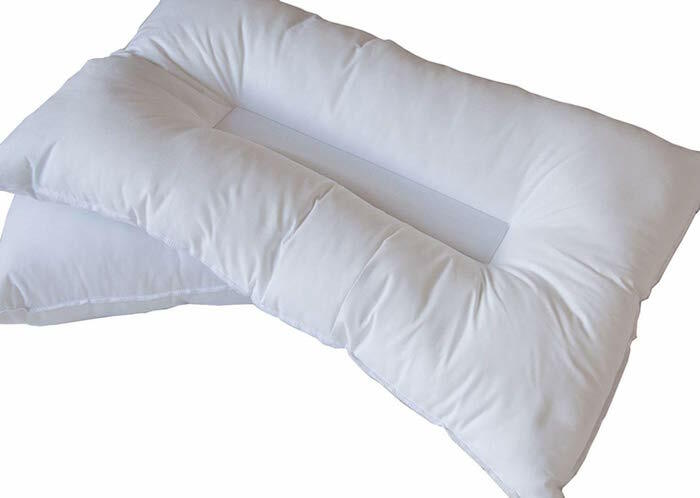 Made in Britain, this pillow has a depressed centre providing a soft base for your head area, and then raised edges for shoulder and neck support to keep your body in a consistent position to alleviate your snoring. What are anti snoring pillows? When you lay in your bed on your pillow, the position of your head affects the way that you sleep including the way airflow passes through your airways. Anti snoring pillows are designed to alter the height and position of your head to reduce your snoring. The pillows are also specific to your natural sleeping position and also takes into account any additional sleep devices that you may be wearing ensuring that you remain comfortable. Because anti snoring pillows are often very different in size and shape to the pillow that you’ve already been using, it can take some time to get used to it. At first, it may feel uncomfortable but give it a couple of weeks, and you’ll find it no different to any other pillow. Anti snoring pillows come in all shapes and sizes, so they’re a solution for all needs and requirements. Memory foam pillows are a way to reduce snoring because the material is firm, so it provides strong support to the head and neck area to keep it aligned. The memory foam also works to contour to the natural shape of your head which is excellent for decreasing snoring. Contour pillows are designed to do precisely what the name suggests. They ensure that your head, neck, shoulders and upper back are in natural alignment while you sleep by contouring to your body shape. These pillows often look slightly odd in appearance due to the concave dip in the middle which leaves the edge being firmer and thicker in size. It ensures that your head is held in the correct position leading to your airways remaining open. These anti snoring pillows are contrasted into a wedge shape and are ideal for back sleepers. The wedge shape raises the head providing support for the head, neck and shoulders while you sleep. It then stops your tongue from sliding to the back of your throat which blocks the airway that causes snoring. Neck cervical support pillows are one of the best types of anti snore pillow and are designed to support the neck and head by way of cradling. It then releases pressure and allows the rest of the spine to align and relax, decreasing snoring. CPAP pillows are used in conjunction with CPAP machines to keep you comfortable throughout sleep. CPAP machines are usually reserved for those with serious snoring problems as well as sleep apnea. CPAP machine users are required to wear an oxygen mask as they sleep, so the pillow ensures that the mask stays in place throughout the night. Anti snoring pillows work to improve the overall alignment of your head and neck as you sleep. It causes your airways to remain open throughout the night which then leads to a reduction or complete removal of vibrations that occur in your throat. As a result of decreasing the amount that you snore, it will improve the quality of sleep that you experience. It will also enhance the quality of sleep that your partner gets as well especially if they regularly complain about being disturbed by your snoring. Anti snoring pillows work to improve the overall posture of your body especially if you choose one that matches your sleeping position. This is because the pillows help to align your neck and head that alleviates the pressure away which avoids blocking your airways. There are much more expensive snoring solutions such as expensive headgear, machines or apps which all add up to being a costly outlay. Anti-snore pillows are relatively cheap and affordable especially considering how long they will last. Anti-snore pillows provide a simple way to solve an annoying problem. They are also far less intrusive than other solutions such as tongue restricting devices and surgery, it’s as simple as ordering the pillow online, and you can be using it the same night that it arrives in the post and quickly be on your way to improved sleep. There are so many options on the market which can make the buying decision overwhelming, but it’s important to choose a pillow that's not just the best but also specific to your individual needs. Anti snoring pillows are made with a whole range of materials including latex and memory foam. The material used is also a good indicator of the overall quality of the pillow; for example, memory foam and latex are often preferred because they maintain their shape even after prolonged use. Your chosen pillow will be profoundly affected by your sleeping position. Each pillow benefits different sleeping positions more than others, so if you picked a pillow that’s more suited for back sleepers when you’re a side sleeper, then you may not experience all the benefits of the pillow. The best quality pillows will often come with a money back satisfaction guarantees. This means that if for any reason you’re not happy with the purchase then you can return it to the manufacturer for a no questions asked refund. The length of the guarantee varies from brand to brand but usually ranges anywhere from 30 days to a year. Different pillows have different costs based on the overall quality of the pillow. If you have a lower budget, It may be worth increasing it slightly because the more expensive pillows tend to last longer and work more effectively due to being made using higher quality materials, so it’s a longer-term investment. Before making a final buying decision, you should consider the size of the pillow. The pillow should match the size of the bed; for example, if you sleep in a small sized bed, you don’t want a large pillow that doesn’t fit. Be sure to look at the size measurements for your intended pillow. As you can see, there are a lot of factors you need to consider before making a final decision. However, there is a large selection of products and solutions for you to choose from. The best anti snoring pillows are great for light and mild snorers, but if you’re a heavy snorer, it's advised that you see a medical professional as you may be suffering from something more serious such as sleep apnea.